How much does house cleaner near you charge? Average cost of house cleaning is $25-50 per hour per cleaner. The total price depends on the size of the home and type of cleaning. A 3-bedroom, 2000 square foot home costs $150 to $250 to clean on average, while a one-bedroom apartment starts at $80 to $110. Deep cleaning, laundry, window cleaning, and move-out or event cleanup will add to the cost. What’s in this Cost Guide? What Affects the Cost of House Cleaning? How to Hire a Great House Cleaner? How Much Do House Cleaners Make Per Hour? What can affects the cost of house cleaning services? Cleaning services and maid charge based on square footage, price per room or price per hour. Because every job is different, most pro or cleaning services will only quote a final rate after performing a walk-through and going through details with you. Most house cleaning companies charge by the hour or by number of bedrooms and bathrooms, but some charge by the square foot. The more square footage to be cleaned, the higher your overall costs will be. A company may charge different rates per square foot depending on the type of cleaning service they are providing. The number of bedrooms you have in your house will play a role in determining cleaning costs. If your cleaning company bases their rates on number of rooms, rather than square footage, your room count matters. Even if your place is only 800 square feet, your cleaning costs will vary depending on whether it’s a studio apartment or a two-bedroom house. Number of bedrooms can often indicate how many people live in the home and how relatively clean or dirty it might be. Usually customers want bedding changed and beds made up, which requires extra time and effort the more bedrooms there are, thus driving up your cost. If you have spare bedrooms that are not being used on a regular basis, you can negotiate with your house cleaners to vacuum and dust the rooms on a less frequent basis, thereby saving you money. A typical standard bathroom cleaning service will include sweeping, mopping, scrubbing the sink and polishing the faucet, wiping the counters, cleaning the mirror(s), scrubbing the shower or tub and polishing the faucet fixtures, and disinfecting the toilet and toilet bowl. This is why having more bathrooms in your home will usually increase the overall cleaning cost. Some cleaning companies charge more for additional bathrooms than they do for additional bedrooms. How much do cleaners charge per hour? One house cleaning service in San Francisco, California, charges an hourly rate based on the number of cleaners required for your job. For two cleaners on site, they charge $30 per hour. For one cleaner on site, they charge $20 per hour. They charge an additional $15 per room to clean windows and an additional $20 per room to clean sliding doors. Some cleaning companies charge an hourly rate, which means the price you pay for each visit can vary with just how dirty your house is that week. Typically, house cleaning companies that do charge by the hour will provide you a walk-through before you hire them. The walk-through allows them to see the size, layout and general cleanliness of your house, and give you an estimate of what a one-time or first-time cleaning will cost as well rates for ongoing services, whether weekly, bi-monthly, or monthly. Typically their hourly rate stays the same, but the one-time or first-time cleaning will cost more because it takes more time. Your cleaning costs will usually be consistent from week to week or month to month, unless you have a particularly messy part or other unusual situation. How much does move out cleaning cost near you? Move out cleaning costs $160-$250 on average for a 2-bedroom apartment or house. The cost will be higher if cleaners have to spend extra time removing carpet stains or wall marks. Many house cleaning companies provide services using green products that are easier on the environment and on humans. The going rate for eco-friendly supplies is $5 or $10 extra per cleaning. According to the Environmental Protection Agency (EPA), many cleaning products, especially industrial-strength cleaning products, are known to contain toxic chemicals that are harmful to adults, children, and the environment. In fact, “cleaning products can present several health and environmental concerns. They may contain chemicals associated with eye, skin, or respiratory irritation, or other human health issues,” according to the EPA. This makes choosing a green company particularly attractive, especially if you have a young child or someone with a compromised immune system in the house. It’s also better for the health of the cleaners who work directly with the products every day. You may pay slightly higher prices if you opt to work with a company that is solely green or that offers green products as an option. Professional (individual) house cleaners most of the times charge less than house cleaning companies. Larger companies usually have more standardized pricing models, are more likely to be bonded and insured, and often perform background checks on their employees. You may decide that the convenience and trust of working with a company is worth the cost. Ask for referrals. Ask for referrals from friends who have used the same cleaning service over time. Choose a company that’s bonded and insured. This protects you and your property in case of theft or damage. Hire a licensed company. This means they are legally registered to operate as a business. Ask for reviews. Look to current and former client reviews to let you know the cleaning company does great work. Conduct a phone interview. Ask them how long they have been in business and ask for recommendations. Compare prices. A company that offers a wildly low price may not be operating legitimately. Develop a relationship. If you’re working with a larger company, request that the same crew come each time. This creates consistency and accountability. Prevent temptation. Lock up valuables like jewelry, cash and credit cards. Consider security. Electronic locks with one-time use codes are handy for giving house cleaning services access to your home while also protecting your privacy. Read client reviews. 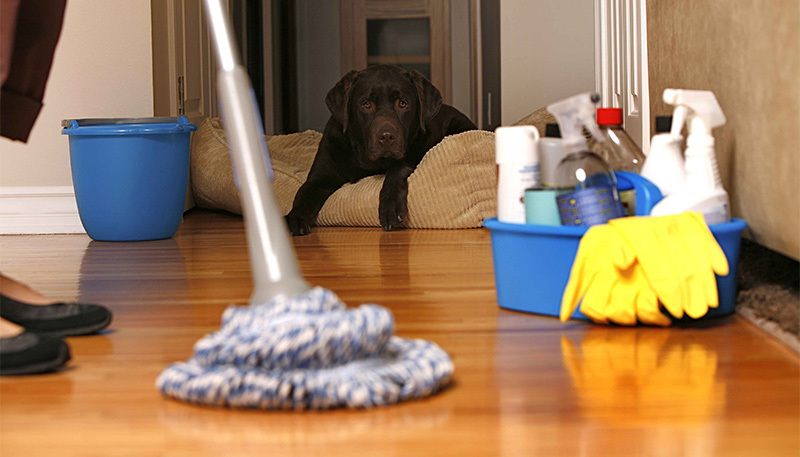 Ask for reviews and follow up with references to make sure you’re choosing the right house cleaning service for you. Agree on a fair price Discuss how you’d like your home cleaned, and work with your cleaner on setting a reasonable price. We’ll Help You find Home Cleaner Near You.